The United Kingdom’s break-up with the European Union is at the center of world attention. On January 15th London time, the British Parliament voted in historic fashion to reject Prime Minister Theresa May’s Brexit plan, setting a record for the largest margin of defeat for a sitting government in the nation’s history. Although Prime Minister May survived a no confidence vote the following day, she faces a daunting task ahead as she tries to craft a workable Brexit deal. Professor Kang Yoo-Duk, an expert on European politics and economy at Hankuk University of Foreign Studies’ Language & Trade Division, explains the situation. The beginnings of the Brexit deal dates back to 2016. A referendum was held in June of 2016 to decide whether the UK should leave or stay in the European Union or EU. Nearly 52% of voters chose to leave. Since then, the UK and the EU have been in negotiations to draw up a withdrawal agreement that addresses not only the terms of departure, but also other minute details such as what kind of relationship the UK and EU will have in the future. After years of negotiation, an agreement was reached in November, 2018, and was signed by the British government, European Union Council, and all EU member nations. However, as the deal also requires the British House of Commons’ approval, a vote was held on January 15, local time. The vast majority of the UK’s members of parliament rejected the deal. The Guardian newspaper reports Prime Minister May has drawn up a Brexit Plan B, and Parliament’s vote on the second plan is to be held on January 29. However, as Professor Kang explained, even if the new plan is accepted by the UK parliament, it would also have to pass all member states as well. The worst possible outcome would be a “No Deal Brexit” in which the UK exits the European Union without reaching any sort of an agreement. The United Kingdom enjoys numerous benefits as an EU member states, with the biggest perks being the “four freedoms.” The “four freedoms” refers to the free movement of goods, services, capital and persons within the EU. It exempts all UK exports to the EU from tariffs and eliminates all barriers when moving in and out of EU nations. In addition, UK nationals are free to live and work throughout the EU. If a no-deal Brexit were to happen, the UK will be treated as a “third country” by the EU with all commerce between the two sides governed by World Trade Organization(WTO) rules. For example, the UK is currently the second-largest carmaker in the EU. These car exports will be subject to a 10 percent tariff if no deal is reached by the deadline. Tariffs on various other items will apply, and goods manufactured in the UK will be required to meet EU regulations or obtain new certifications. The UK joined the European Economic Communities, the predecessor of the EU, in 1973, and has enjoyed an increasingly expansive trade relationship with the European continent ever since. However, if no Brexit deal can be agreed upon by the March 29 deadline, the UK will be forced to forge brand new independent trade deals from scratch. A no-deal Brexit may also lead to extreme price hikes and commodity shortages. The Bank of England warned that a no-deal Brexit could cause the country’s GDP to fall by 8 percent, unemployment to rise 7.5 percent, and house prices to fall up to 30 percent. 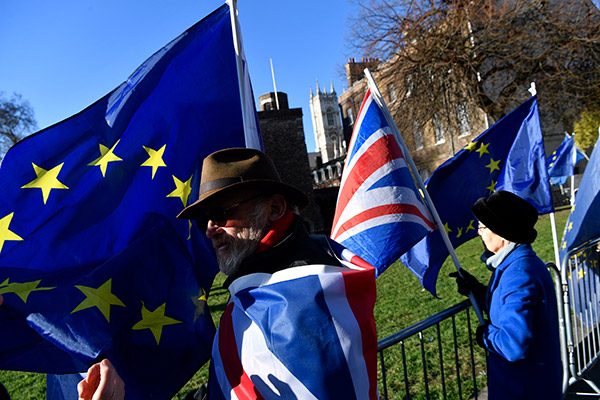 Depending on its shape and form, Brexit may also pose a serious threat to the global economy, according to the World Bank. The Korean economy, which inked a free trade deal with the EU in 2011, may also be hit negatively. When Korean firms export to or import from the UK, most items are covered under the Korea-EU FTA, and therefore are exchanged tariff-free or at very low rates. However, if the UK exits the EU without a deal, Korea-UK trade will no longer be covered by Korea-EU FTA rules and tariffs will be restored. For example, tariffs on Korean cars exported to the UK will rise from the current near-0% to 10%, while those on UK car imports will increase to 8%. In the end, overall prices will rise, dealing a possible blow to both the UK and Korean economies. At first look, it may appear that a no-deal Brexit would have minimal impact on the Korean economy, as Korea’s exports to the UK amounted to just about 1 percent of the country’s overall exports. However, as Professor Kang points out, there are many uncertainties ahead which may bode ill for Korea’s exporters. For instance, tariffs on cars, one of Korea’s major export items to the UK, are expected to rise up to 10 percent from the current zero percent, and those of car parts are projected to rise up to 4.5%. But more importantly, if the UK economy nosedives after Brexit, international market volatility will expand, exposing Korea to lower export demand and external risks. That is why the international community has its eyes on Brexit as the March 29th deadline quickly approaches. No matter what kind of measures are taken, it is improbable that an agreement will be reached before March 29, as there are only about 2 months left. Extending the deadline is possible, but all parties in London and throughout the EU must agree to it. So it appears that a bit of concession is needed. Aside from a renegotiation, a second referendum is another possibility. Considering the current state of politics in the UK, it is unlikely Members of Parliament will be able to forge an agreement internally, increasing calls for a second public referendum. Whether or not a second referendum is held, Brexit may be pushed back from its current March 29th deadline. In fact, the EU has already announced that it will accept a request by the UK to delay the exit date, if proposed, in order to reduce negative impacts. As it is still unknown what decision will come from London, all possible scenarios remain on the table. A no-deal Brexit in itself has relatively small macroeconomic impact on Korea. But it is still a problem, as it could shake up the global market and indirectly effects Korea’s economy. As these effects cannot be overlooked, Seoul is working rapidly to respond to the situation. At the moment, the key is for the government is project a strong willingness to act that will hopefully be enough to quell concerns in the market. Seoul’s proactive efforts in crafting a Korea-UK Free Trade Agreement is one such example of this. When it became clear Prime Minister May’s Brexit deal would be rejected by the UK Parliament on January 15th London time, the Korean government convened to discuss possible outcome scenarios. It also sped up the creation of a Korea-UK Free Trade Agreement. The Bank of Korea, for its part, held a meeting to look at potential impacts on the domestic and foreign exchange markets. With the future of Brexit still murky, detailed measures must be devised per every possible scenario. Korea stands ready to mitigate any potential hazards brought on by a no-deal Brexit.